Many people in this country drive several hours a day for their jobs. Some of them commute an hour or more to and from work each day, while others drive to different locations all day long. Truck drivers and individuals working in sales often spend almost their entire working days in their vehicles. Don’t let driving affect your health. Driving has long been considered one of the most dangerous occupations or work activities in the United States. Most realize that the long days on the nation’s roads and highways create risks for accidents and subsequent traumatic injuries. However, the very nature of the activity can set drivers up for chronic health problems and musculoskeletal complaints as well. Sitting for hours on end without breaks, often combined with poor posture and inadequate lumbar support, can lead to high rates of low back pain among long-distance drivers. While the nature of sitting in the car or truck and the compressive forces on the spine can’t be changed much, drivers can and should work to prevent low back problems. 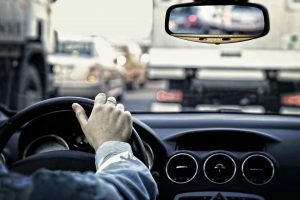 In addition to musculoskeletal maladies, driving for hours on end, day after day can cause long-term problems to drivers’ general health. Factor in smoking, poor nutritional choices, stress, and lack of exercise during their personal time and it’s easy to understand why obesity, high blood pressure, and cardiovascular disease are so common among professional drivers. Fortunately many of these problems can be reversed. Start slowly and make incremental changes. Remember to take breaks and walk. If possible, breaking daily drives into shorter segments to walk around and relieve pressure on the low back might help drivers with, or at risk for, low back pain. Incorporate exercises to prevent low back pain. Perform lower back muscular strengthening and stretching exercises regularly. Strengthen the abdominal and other core muscles on a daily basis might prevent low back pain. Add twenty to thirty minutes of cardiovascular exercise, such as walking or jogging, three days per week. Over time drivers can increase their regimen to perform these types of exercise daily to maintain an optimal body weight. Slowly cut back on cigarette smoking and eventually quit altogether. Avoid the abundant fast food restaurants and choose more nutritionally balanced meals. Better nutrition can help to reduce high blood pressure and prevent cardiovascular disease. Most of us deal with stressful jobs. Workers who spend long hours in their vehicles deal with additional physical and emotional stresses. Fortunately small but progressive changes in work habits, personal exercise, and nutrition choices can lead drivers to healthier, more fit lifestyles while dealing with the pressures of the jobs. What might explain the large increase in arthroscopic SLAP repairs?